Broad Avenue is home to the most eclectic collection of public art in Memphis, including the tallest. Our water tower's mural and evening light show soar 150 feet in the air. It is our beacon to welcome you to the Binghampton community and Broad Avenue. Artists Tim Watkins and Carol May created two artist inspired bus shelters for the city of Memphis. The shelter is both artistic and functional, connecting MATA’s well-traveled Hollywood bus route with The Hampline. Many thanks to Memphis Area Transit Authority, City of Memphis and Urban Art Commission for this installation. The railing for the grand entrance to the Water Tower Pavilion features section features Memphis artist Elisha Gold’s tribute to The Hampline and importance of bicycles in helping redevelop Broad Avenue. This sculpture was provided by a grant from Artplace America. Students from one of the Binghampton school’s helped artist Tom Clifton (co-owner of T Clifton Art on Broad Avenue) paint this large scale, color block mural. In Greek mythology, Terpsichore "delight in dancing" was one of the nine Muses and goddess of dance and chorus. 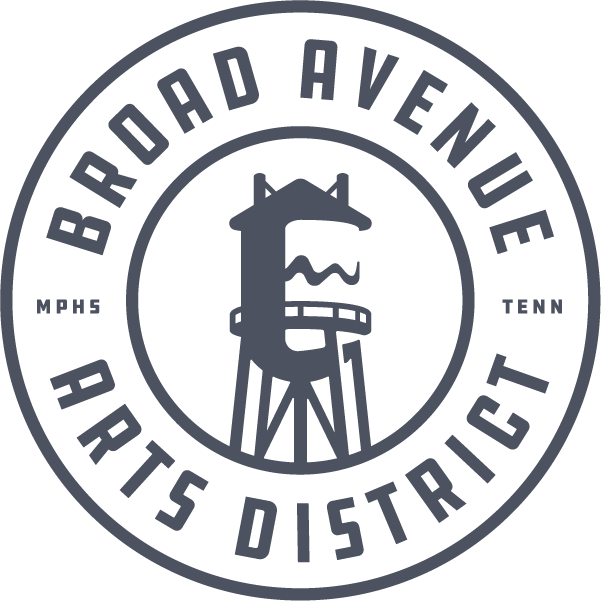 The artist designed the color blocks to give a feeling of dance and movement, honoring Broad Avenue “Dance on Broad” series. The mural was provided by a grant from Artplace America. The Water Tower mural and light show is Memphis’ tallest installation of public art, soaring 150 feet into the air. The mural design reflects the topography of the Mississippi River. The starburst represents Memphis’ location on the river as well as Binghampton’s location in the heart of Memphis. The bands of color reflect the neighborhood’s multicultural roots. Many thanks to Artplace America, Loeb Properties and Urban Art Commission for making this installation possible. Also, thanks to Gephart electric for scaling the height to install the electrical for the lighting. This mural honors famous (or infamous) Memphians and events. The artist changes the mural every six to eight months, so you never know who will greet you on your way to the tasting room of Wiseacre Brewing Company. This student mural outside of Falling Into Place is a popular location for photos. This mural is part of the “I Love Memphis” mural series that the UrbanArt Commission, the Convention and Visitors Bureau, and the City of Memphis has commissioned for the city. This mural was painted by Michael Roy, a Memphis College of Art graduate. The mural depicts a large creature made of other creatures, painted in blue on a darker blue background. The text was painted by Brandon Marshall, another Memphis artist. Inspired by the Broad Avenue renewal, the owners of Memphis Laminating asked Memphis artist Meredith Cole to create a mural reflecting the neighborhood, water tower and Overton Park. The mural incorporates symbolism with the birds reflecting people from all parts of Memphis coming to dance, listen to the music and take in the vibe of Broad Avenue.